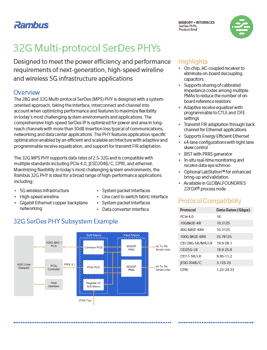 The Rambus 32 Gbps Multi-Protocol SerDes (MPS) PHY is a comprehensive IP solution that is optimized for power and area in long-reach channels typical of communications, networking and data center applications. With high performance and multi-protocol compatibility, the PHYs support data rates from 2.5Gbps to 32Gbps in a wide range of industry-standard interconnect protocols including PCIe 4.0, JESD204B/C, CPRI, and ethernet. It features application-specific optimization enabled by an efficient and scalable architecture with adaptive and programmable receive equalization, and support for transmit FIR adaptation.